Join the discussion on our forums! Come discuss Mark of the Lotus over in our dedicated Mark of the Lotus discussion topic. The mark of the Lotus is a little flower drawn in permanent marker on the ankle. Spawn of N'Zoth Evolved into a spell which costs 2 less. This is the most OP out of all the cards revealed so far (34/132). 2 of this + 2 Power of the Wild. Guess I'll have to craft Fandral now since token druid will be wrecking ladder soon. Nope not really,Reno decks do well against it. Unless you get it from webspinner though. The big deal here is the cheap redundancy with power of the wild I feel, some token druids will definitely be running both. Just look at how onyx bishop was *almost* enough to make resurrect priest a good deck, adding some more consistency so they don't have to be entirely reliant on drawing a copy of a card they can only ever have two of. This is already a thing druid likes to have, and I don't feel like more of it is going to hurt them. I don't think this is gonna be run over Power of the Wild; but if both get run ALONGSIDE one another... That's where trouble might be. Keep an eye out on this one, just in case it makes it into a decklist. So is blizzard saying "Druid will also be Monk now"? 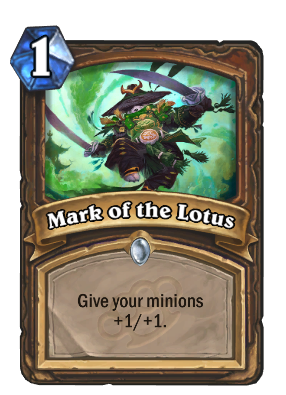 Divine Strength for a one minion, Mark of the Lotus all friendly minions. Give +1/+1 to ALL the tokens. RIP Power of Wild and Wisps of the Old Gods. This card screams "PUT ME IN TOKEN DRUID!!!!"